Please have a look at our extensive galleries, for examples of our work; which are intended to show the quality of our production, the range of options available, and the finish and texture of the different cards we offer. Alternatively, if you’d like some FREE physical samples of our business cards – which will also entitle you to £10 off your first order with us – so that you can see the quality of our production and materials in person before you place your order – please fill in the form below to request a business card sample pack, which will usually be delivered to you the very next working day. Your sample pack (our current pack is shown above**) will contain a range of samples from both our printed Premium and bespoke luxury ‘Individual‘ ranges, and covers several options including card colour, thickness, different letterpress foiling colours, and blind debossing. Specific requests e.g. for certain foil or card colours, can also be requested and provided at no additional charge as part of your full order. Please note: due to their bespoke nature, our sample packs are expensive to produce. So that we can continue to offer this service free-of-charge to genuine clients, we would respectfully request that you only order a sample pack if you’re interested in placing an order with us in the future. Thank you for your co-operation! Delivery is free of charge to UK Mainland; for international samples requests please contact us! 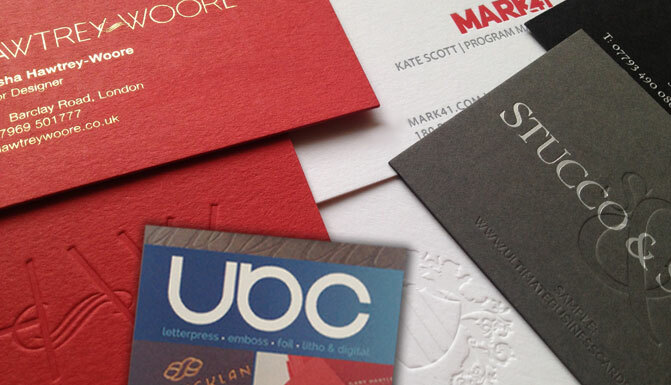 We’re so confident that you’ll be impressed by our business cards, that – as a ‘thank you’ for requesting our samples – we’ll give you £10 off your first order with us. A unique £10-off code will be emailed to you upon despatch of your sample pack.